Albin F. Irzyk was an American brigadier general who was the oldest living veteran of the 3rd Cavalry Regiment. Joining the Army in 1940, he was the Commander of the 8th Tank Battalion of the 4th Armored Division of the United States Army during World War II, the Commander of the 14th Armored Cavalry Regiment during the Berlin Crisis of 1961, and Assistant Commander of the 4th Infantry Division in South Vietnam during his career. 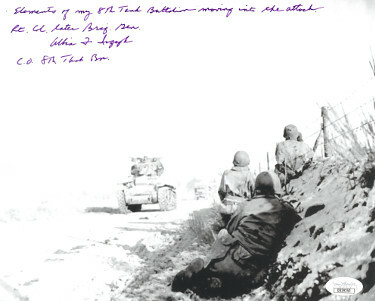 Brigadier General Albin F. Irzyk has hand signed this 8x10 Photo with long inscription. JSA Hologram #DD39253 and Certificate of Authenticity.